A good Pew Bible should feel sturdy and reassuring to the touch. Biblica knows this and takes special care in constructing each and every one of their Economy, Hardcover, Witness and Worship edition Bibles. As you know, the Bibles that you place in your Pews for public use see untold abuse. These books are ruggedly built to withstand a long life in the pews of your congregation. 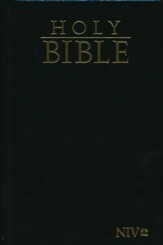 Biblica publishes a variety of Bibles intended for use as Pew Bibles. Aside from the variation of Bibles versions such as KJV, NVI, NIV, TNIV, NLT and NRSV, we also offer large print, compact and paperback Pew Bibles. All of these items are made very affordable when you purchase them in bulk by the case quantity. Your Bibles are a reflection of your church. So why not purchase only the very best Bibles so that they last for years to come? Most of the items below are available in both as single copies as well as in bulk quantities by the case. Carefully bound and perfect as gifts or prizes, our Pew Bibles are second to none! Some of these Bibles can be custom engraved with your congregation's name and logo at a reasonable cost.